I knew that that word was like the others: just a shape to fill a lack; that when the right time came, you wouldn’t need a word for that anymore than for pride or fear. Gus Malzahn stood smacking gum on the 20-yard line after the Georgia victory. He wasn’t alone but he might as well have been. There he stood, stolid, visor straight and proper, right hand holding the recent game’s plays, weight shifted to his left leg, in the midst of a celebratory crowd milling about. Or that’s how I remember him. How I choose to remember him standing there. It was my last home game as a student. A tableau was created and intermingled with the four previous years; mental snapshots were taken; the truth was twisted and turned to fit future nostalgic standards. If any season deserved a group of grandiose memories saved for deathbed review, it was this one. And then, with the students still in full force and assorted players, coaches, family and media members scattered throughout the south endzone’s redzone, some brilliant person OK’d the playing of the season’s highlights set to The Black Eyed Peas’ “I Gotta Feeling” on AUHD. To the joy of the thousands, tens of thousands, still in the stadium, there was Newton, McCalebb, Fairley and the rest all in HD glory mixed with beats by will.i.am and the not-quite-Jim-Fyffe-but-great-in-his-own-right calls of Rod Bramblett. Near the end, after the Bo and Dyer moment I think it was, I looked back at Malzahn. He hadn’t moved. Others around him were huddled in twos and threes laughing and talking. But he was still staring at the screen, mouth open, jaw not engaging in his second favorite “vice” behind coffee. He looked amazed. He looked like a proud parent. He looked like a kid watching a magician. Now you see Cam. . . But maybe that’s just what I wanted to see. I was always going to attend Auburn. There was no choice involved. Not really. 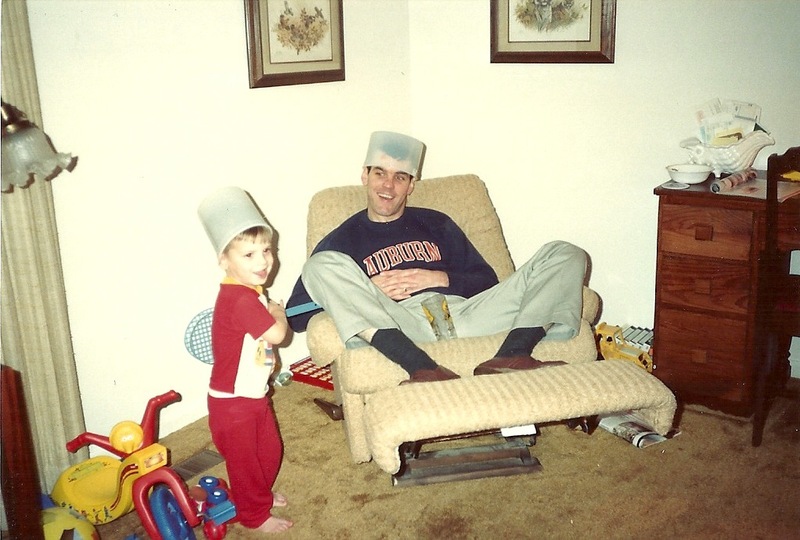 My parents, both Auburn grads, got to me when my head was still soft and my brain even more malleable than it is now. One baby picture shows me relaxing in the overturned turtle wearing a “Future Auburn Tiger” onesie, my dad giving me the peek-a-boo eyes. At 5, 6 or 7, I’m wearing a full Auburn uniform, No. 12, Russell Athletic. At 12, I’m watching and rewatching and rewatching and watching just one more time, just once more before bed, please, please, please, AttitUde: The Story of the 1993 Auburn Tigers. At 17, I’m defending the honor of Bo Jackson and Auburn during a high school economics class from my yahoo teacher who thinks some jackleg Tennessee running back named Chuck Webb was a better athlete and running back than Bo. Ridiculous. Freaking ridiculous. Bo might be the greatest athlete human birthing has ever produced. Don’t tell me some fool named Chuck Webb was better. I will not sit here and listen to these lies. “Shouldn’t we talk about Adam Smith now?” NO! Auburn’s honor, and therefore my honor, has been besmirched. This is the same teacher, that poor, poor deranged man, who thought Auburn’s 2004 team was not empirically better than the 2004 version of Tennessee—yes, even after Auburn beat Tennessee twice. I set him straight by handwriting a handy comparison chart of statistics from the two games, with a bonus commentary section, on the back of an economics worksheet. We never argued college football again and I spent the rest of the year facedown drooling into a textbook. So when I took a campus tour my senior year and I heard the college kid in the orange polo talk to the group about Cater Lawn and meal plans and Hey Day I scoffed. Show me the stadium. Take me to meet Coach Tuberville. Let me roam the halls of my heroes. At that time, Auburn football was Auburn University. Now, of course, as a sage and learned graduate of Auburn, I realize an Auburn Man extends beyond the fan. Auburn University is, and always has been, about more than athletics. But without Auburn football I don’t think I would’ve realized how much Auburn can mean to a person, one who’s walked its hallowed halls and sadly bid adieu. Without Auburn football I don’t even think I’d have attended Auburn. For better or worse, my view of Auburn—the town, the University, the aura—is inescapably linked with football forever. I’m not sure if that’s good or bad, and I guess it doesn’t much matter, but it’s the truth as I know it. In a way, Auburn football has shaped my entire life. My shaker is balding. Instead of a healthy, full head of hair, with strands that go Whoosh! when shaken, it’s only got a few navy and orange half-strands. 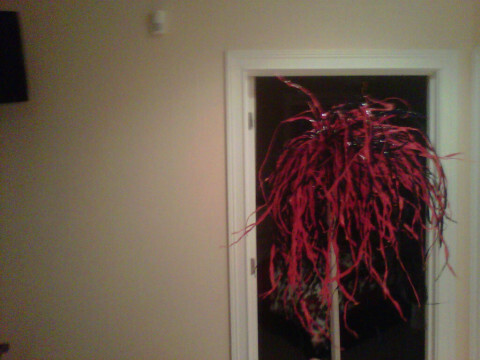 I can’t Warrrrr Eagle properly and shaking it in celebration is no better than shaking a plastic stick. But it’s my “lucky” shaker. We’ve been through five football seasons in the student section. I can’t abandon it now. Not on the cusp of immortality. My shaker is balding because I constantly rip and stretch individual strands throughout games, especially close games, especially home games against LSU. Call it nerves. Call it tradition. My roommate sophomore year was worse. His shaker, which he’d had for years, had about 12 plastic strands. His had the look of stringy troll doll hair. The concrete below our feet was a shaker battlefield hospital, orange and navy extremities scattered everywhere. My first year at Auburn was 2006, my last this season. There have been better, more consistent periods of Auburn football—the mid to late-’50s, a large chunk of the ’80s, 1993-1997 maybe—but 2006-10 is a perfect microcosm of Auburn football history. Those five years encompass the totality of what it means to be an Auburn football fan. 2006 was Auburn football near its peak. The previous two years, 2004 and 2005, were by far Tuberville’s best two teams. The 2005 team was starting Kenny Irons against Georgia Tech and a made John Vaughn field goal from a rematch with Georgia in the SEC Championship game and perhaps from there a National Championship appearance. The 2006 team won 11 games through luck and grit and confidence borrowed from the previous two seasons. If my football watching years at Auburn are a narrative, 2006 was the hero before the fall, Han Solo flying toward Cloud City, Snow White reaching for the poisoned apple. 2007 was what we had all feared. Auburn was in decline. And luck wasn’t with this team like it had been the year before. Sure, there were great moments along the way—Byrum in the Swamp, Six, the Chick-fil-A Bowl—but the writing on the wall was becoming legible. Tubby tossed Borges out of the hold hoping to gain altitude. It seemed to work. Tony Franklin was to be Auburn’s spread savior. This was Auburn looking toward the bright, new-fangled future of offense! Right idea, wrong guy. 2008: 3-2. This was the bottom. The depths. 36-0 coupled with Chizik added to the Tide’s undeniable and impending rise led to despair. Auburn was in for years of wandering in the wilderness. The Tide were undoubtedly going to start a streak of their own. There was no way Chizik could win at Auburn. No way. Auburn was going to be a West whipping boy for years to come. 2009 was the year of renewed hope. The 5-0 start ended with 8-5, but Malzahn proved his worth by turning Chris Todd and Auburn’s awful offense into something serviceable. The Iron Bowl let Alabama know Auburn was not scared. An Outback Bowl victory and a top 5 recruiting class, which included some giant junior college quarterback named Cam Newton, setup the final chapter: Frodo and Sam walking up Mount Doom, Luke being taken before the Emperor, Maximus stepping into the arena. 2010 is the climax. Not even the biggest, brashest Auburn fan would have thought it would happen this soon. Six years after 2004, only two years after 2008, and here we are—at the mountaintop. Common wisdom says college football is cyclical. Makes sense. It’d be hard to look at the last five years of Auburn football and deny it. If these years really are a narrative, then Cam Newton is Auburn’s deus ex machina. I’ve been trying to write about this team since September. But words have betrayed me. They, words, take on a different, altogether new and pressing importance when you want to be some sort of writer. That importance is never clearer, never more humming in the forefront of the frontal lobe, then when you don’t have them, or at least not the right words. To a wannabe writer, impotence is the inability to articulate. And even if you do think you have the right words, putting an experience into words instantly cheapens it. Something is always lost in the translation from reality to text. The best writers are those who transcribe the most life per page. The masters remind us of feelings and thoughts we already know but are unable to put into words ourselves. That’s the power of words. It’s in the reminding. We already know; we’ve already felt. We just need someone to tell us. Analyzing and disassembling the 2010 Auburn football season destroys some of the magic. That’s hard for me to type. I’ve always been a bit of a stats guy. (Which perhaps stems from owning and playing every version of NCAA Football for the Xbox since 2002 and my unending quest for virtual statistical dominance and awards.) I’m always a bit peeved when the bottom line on ESPN doesn’t include stats along with scores. But, as I’ve gotten older, I’ve come to realize the best part of sports, the parts that make sports relevant and real and meaningful, are the hardest to articulate. For me, football fandom is a feeling. And all the above is an attempt to bottle that feeling and shake it until it’s unconscious and ready to be dissected and dissembled—my attempt to see just what the hell it is. Mostly though, shapes to fill a lack. I tell myself winning is in the attempt. This season is undoubtedly one of the greatest in Auburn history. If all goes as planned on Jan. 10, I’d say it will be the greatest. I wish I could tell you exactly how great it’s been for me, and I wish you could tell me what it’s meant to you. Until human evolution takes the next link and we’re all telepathic, words will have to do. I can tell you why I went to Auburn or how my eyes tear when I watch old Auburn videos or how I hugged an Auburn lady and chest-bumped an Auburn fellow after the Iron Bowl with purity and derision in the upper-deck of Bryant-Denny, my knees about to buckle from joy or how I feel sappy typing all this but keep going because, dangit, I’m trying to share some earnest feelings here. But that doesn’t come close to the actuality. And that’s OK. I don’t feel bad and you shouldn’t either. We each get our share of unspeakable, subtle, sublime moments. In some ways, that’s better, I think. So cherish what you can’t say about this season and about life in general. Seems to me that’s the stuff that matters most. Ben Bartley is a graduate of Auburn University. He would one day like to get paid for this whole writing business. (Feel free to offer him money.) In the meantime, he’s TWER’s assistant editor / water boy. Write to him at [email protected]. (Did you read his story ‘The Mysterious Auburn Man”? It was reprinted in the winter issue of Auburn Magazine). If you’d like to help TWER keep the lights on and the obsession with Auburn lore unhealthy through the winter, click here. Dude, I am speech less.. that was down right beautiful. Ben, I would say that you have done a pretty good job of translating feelings to words, or at least your article made me refeel every feeling I felt this season, which I would think is a pretty good job. I started Auburn in the fall of 2004, narrowly missing our chance for the NC. I graduated this past May, and I’m flying to Glendale tomorrow! War Eagle! Damn fine work, Ben. As a fellow AU Journalism grad (1986), you do us proud. That last part about not being able to express what this all means explains the frustration that I think all of us (to some extent) have been feeling all season. I want so bad to explain to people what this all means to me but the words fail me. I guess knowing that everyone is sharing in the same experience and no one can quite explain it is comforting. Every generation connected to AU has some kind of experiences like this– you make me think of John and me and our friends all crowded into the upper corner of the student section, in a mass hug and falling down three rows together as we beat FSU in 1990 in our final season as undergrads in Jordan-Hare. Or the 1989 bama game. It’s so cool to know this kind of thing is renewed every generation and every new crop of Auburn people has something new to cling to, to believe in, to draw inspiration from, year after year. And the shaker thing is funny– “in my day” we had paper shakers, and by the time I graduated, my own “lucky shaker” (upon which I inscribed the scores of all the games it had been to with me) was down to a stick and a few inch-long orange and blue stubs. Hah. I wish I knew what ever became of it..! Dang, I only have a minor in Journalism (mostly at Housel’s knee.). Can’t write my way out of a paper bag, but you….wow. I’m glad the torch has passed to such capable hands. Bout’ all I can say is …War Eagle…to that. The lump in my throat, the sting of tears in my eyes, the chill bumps that run down my spine, the feeling that my chest will literally explode with love/pride/emotional overload of my beloved alma mater (class of ’94). This season just cant’ be put into words. You have to be a part of it to really ‘get’ it. And I agree that it is comforting to know others are sharing the same indescribeable experiences. I wish there was a way to bottle the feeling and share it with the players….do you think they have any idea what their hard work and dedication this year has meant to the Family?? You made me relive that moment way back in 1994 when, all the way up in the last row of the Sunshine Seats at Ben Hill Griffin Stadium, I had a ten second relationship with a pretty girl whose name I’ll never know all because Frank Sanders leapt (what seemed like) 10 feet in the air and caught a football. Foy — that’s the sexiest story I’ve ever heard. Whether high-fiving with Van in the student section years ago or running out in the yard to roll a tree with my kids after we beat bama a few weeks ago, it is the shared experience with other people that makes it more significant and meaningful. Not to bring everyone down but I’m sure you guys read or heard about Thamel’s latest broadside, and I’ve read a couple comments on other sites saying he has more on the Cecil N. crap on tap this weekend. Gotta love the timing. Anybody have any idea what might be coming? Or for that matter, why the NYT seems to scrutinize Auburn football like it’s the Pentagon? I posted this before at the end of a thread so maybe no one saw it. I don’t know who wrote it, but my mom had it framed and hung in our house when I was growing up. I also had a lucky shaker. By the time lost it in Columbia at the ’97 Auburn-South Carolina game most of the shreds were long gone and the handle was duct taped to another shaker due to multiple fractures. 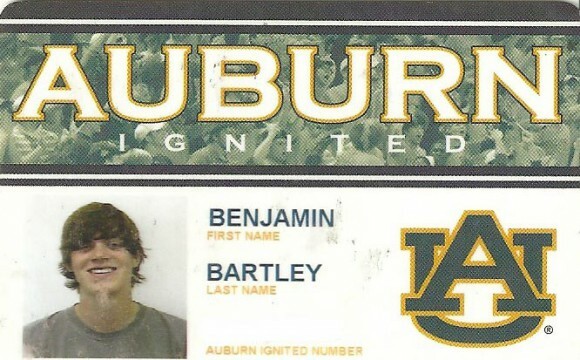 War Eagle, Ben Bartley. War Damn Eagle. Thank you all very much for the kind words. I truly appreciate your comments. Not my best hair day(s). Situation has been rectified. But then I’m honest with myself. I could never go to another SEC school, those are our rivals. And anywhere else it just isn’t real football. While Auburn is a pretty good school in its own right, the football makes it whole. This season more than any other has made me realize that. I feel the same way.. Auburn is as much of my life as my wife..Now she totally addicted to Auburn.. All you have to do is walk in our home. We have signed gear and posters all over. I look forward to football season every year. Been going sence the Pat Dye years. War eagle .. just 1 more ..
Well written, sir. You had me feeling like I was back on campus and experiencing things fresh. I used to get press passes to shoot the games from the sidelines, but that ended in 2004. Nice to feel as if I’d actually been there during the magic. Call me a traditionalist but I miss the days of the paper shaker. Remember how they tasted? Of course you don’t because you aren’t a moron like I am. They had a very distinct chemical taste. When it rained they resembled soggy fruity pebbles. I loved those darn fruity pebbles though.